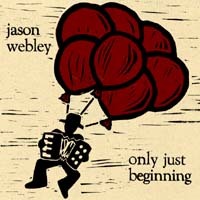 In case I have any readers left, Jason Webley is having a CD release concert at Town Hall tonight. Nice venue, comfy seats, and a Jason show. What more could you want? The new album has shipped — I got my copy a couple of days ago. There’s a preview at his label. It’s more contemplative than his other releases much more in the style of Counterpoint than the earlier two.